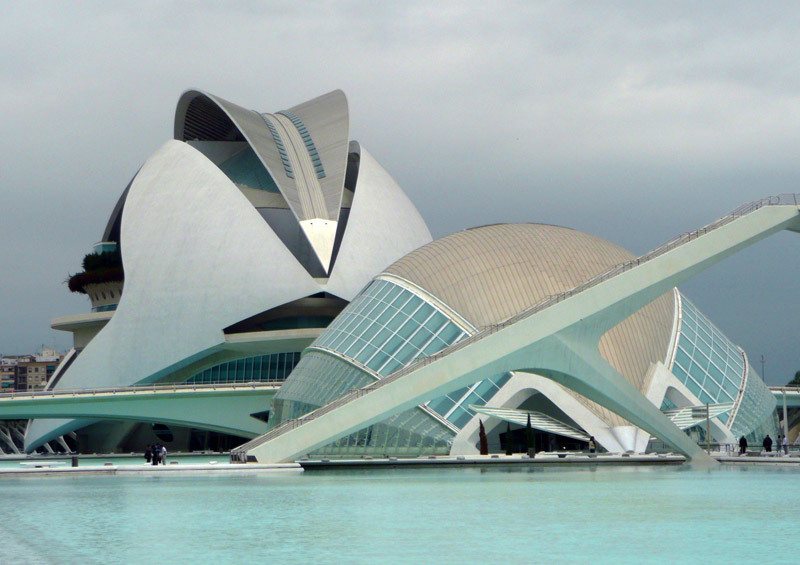 The City of Arts and Sciences is a magnificent collection of buildings by the contemporary architect Santiago Calatrava. These unique, progressive, sculpted buildings took my breath away! Truly beautiful work. The complex is devoted to Science and Culture and has 5 main parts. I was drawn to the Palau de les Arts Reina Sofía (Opera house) and the Hemisfèric (IMAX and digital projections) They are positioned one next to the other within a vast reflective pool(11.000 square meters). The water is symbolic as the complex is positioned and the end of the old river Turia which was rerouted after flooding in 1957. This reflective pool gives a ‘glacial’ blue glow to the whole complex. 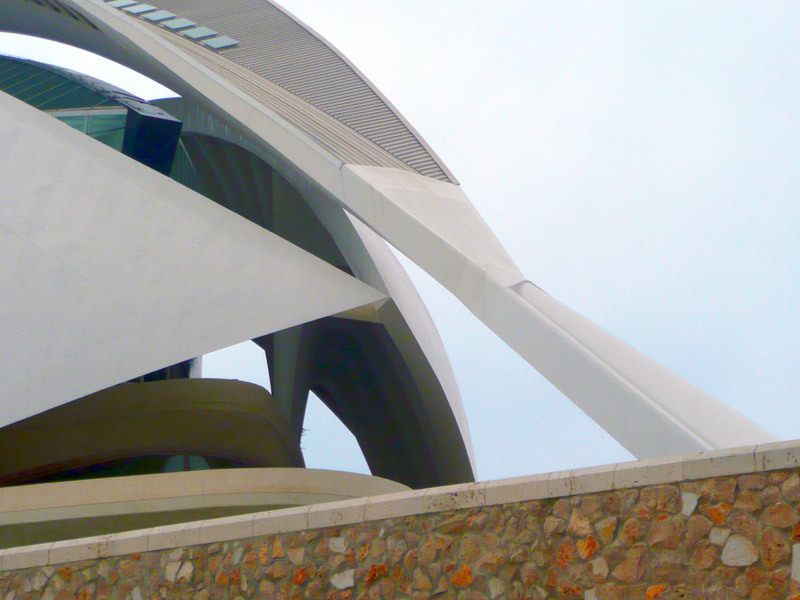 The Palau de les Arts Reina Sofía is a spectacular building that appears to preside over the whole complex. It looks like a huge ship floating on the river Turia, its freeform futuristic design conjures up thoughts of Star Trek. Maybe a space – ship! It was closed when we were there but from the outside we could see panoramic lifts and cantilevered balconies and strips of garden. I could imagine our Chelsea 2008 garden fitting in perfectly on one of the terraces! The Chelsea gardens’ sculptural white corian walkways and seating areas would blend seamlessly with architecture of this kind. The most fascinating element I thought was the elegant feather like structure that appeared to float over the building! It is fixed to the ground on only one side and spans the entire structure ending in a delicate point in mid air! No mean feat considering how heavy the structure must be! Engineering genius! 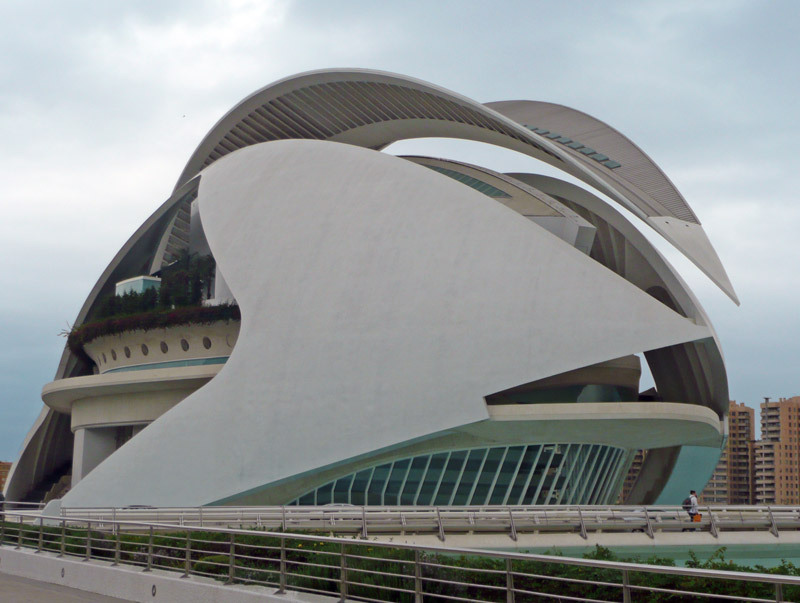 This was my first introduction to the works of Santiago Calatrava. I am hooked. Each of the buildings in the complex is different yet they all sit together effortlessly. His shapes and design seem similar to the fantastic work of Zaha Hadid. I particularly noticed the sinuous shapes of the exposed supporting structures. The organic yet “out of this world” shapes beg to be explored.